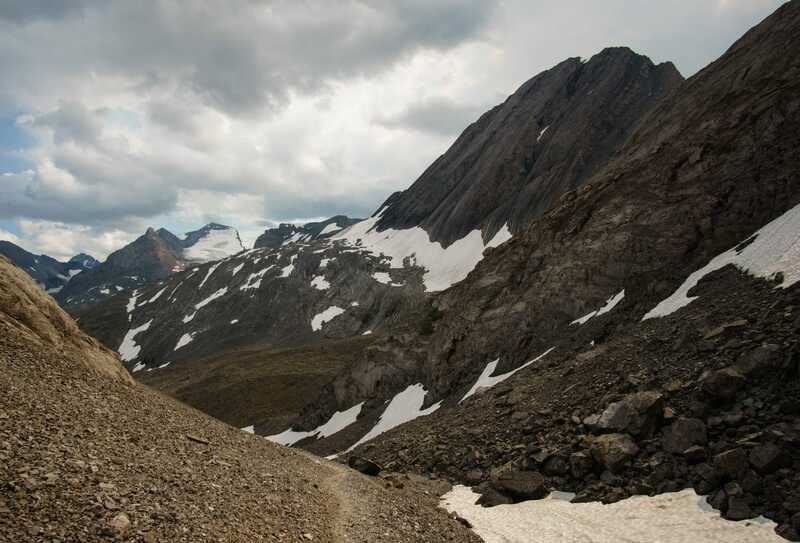 Few trails in the Alberta Rockies are as challenging but immensely rewarding as the Northover Ridge hike. 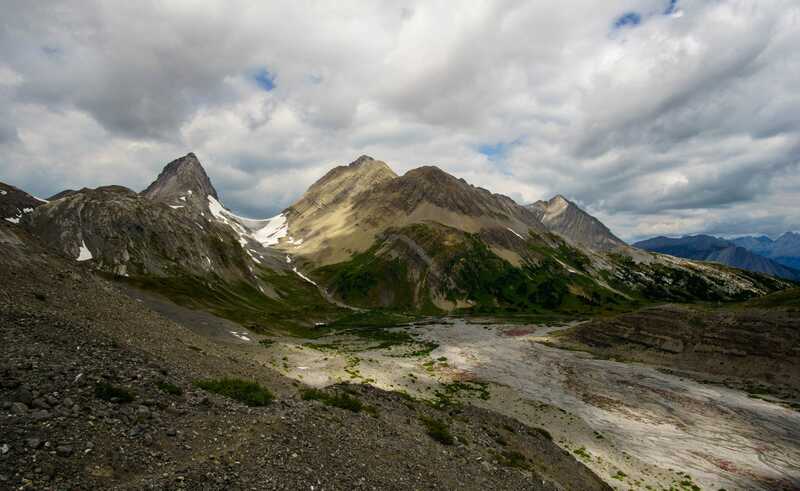 Deep in the heart of Kananaskis Country (a series of provincial parks that are closer to Calgary and less busy than Banff National Park), Northover Ridge is a 36km loop that takes the average hiker about 3 days. The trail straddles the continental divide between Alberta and British Columbia and is a considered a very challenging trip due to a narrow ridgewalk and the need for advanced routefinding skills as we learned all too clearly (more on that later). 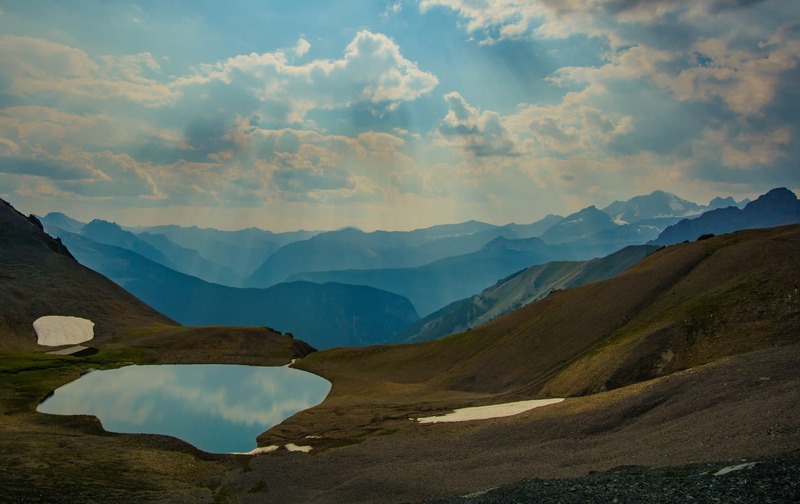 Despite these challenges, it’s path through meandering wilderness, breathtaking views, and exhilarating climax atop the ridge adds to its reputation as one of the best backpacking trips in Alberta. To that end, opinionated experts such as the Copelands who wrote Don’t Waste Your Time in the Canadian Rockies, give it such a resounding recommendation that we knew that it had to be part of our Alberta Bucketlist. 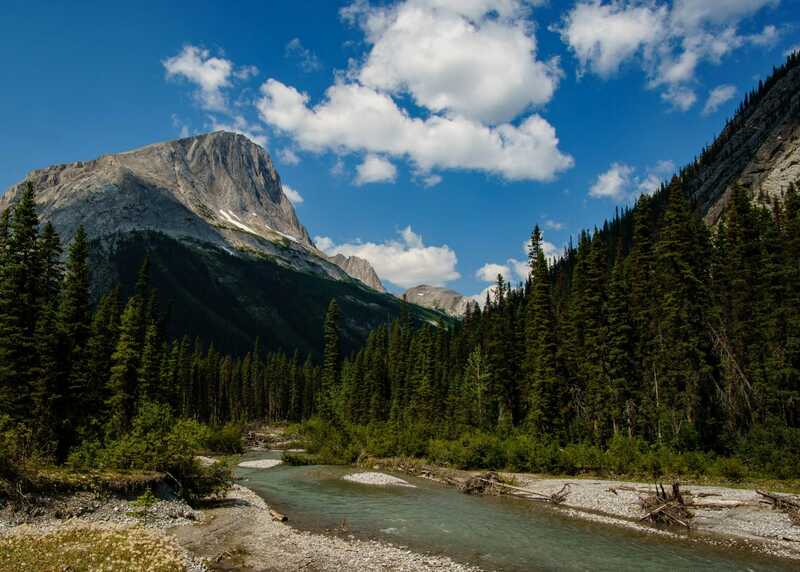 The trailhead for the Northover Ridge hike starts at the beautiful Kananaskis Lakes, which are a destination in their own right. It can be done in either direction, starting at Upper Kananaskis Lake or Interlake . 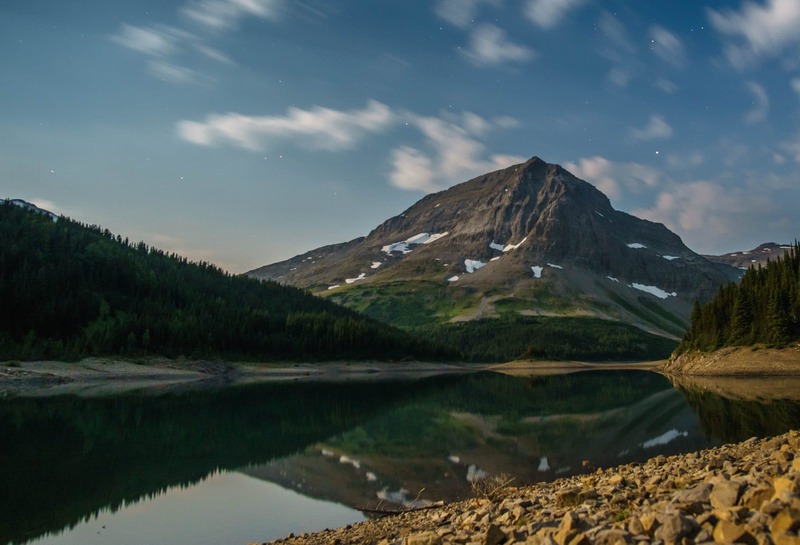 Our trip description will be for the clockwise route starting at Upper Kananaskis Lake and finishing at Interlake but you can do the trip either way depending on your preference or campground availability. If you hike the clockwise loop, your campground for the first night would be Aster Lake and Three Island Lake for the second. The Copelands recommend beginning at Interlake which makes the trail steeper in the beginning but would likely make the routefinding easier. The campgrounds would obviously be reversed if you did it this way. Overall, the trip is a 36km round trip from Upper Kananaskis Lake to the Interlake parking lot. With some luck you can get a ride back to Upper Kananaskis Lake, saving 4km of hiking along the road. Having hiked the Iceline Trail earlier in the summer and the Skyline Trail in Jasper last summer we were feeling pretty confident in our ability to complete the trail despite it’s challenging reputation. To get to the trailhead from Calgary drive west on Highway One, turn south on Highway 40, then at the end of Highway 40, turn right onto Kananaskis Lakes Trail. 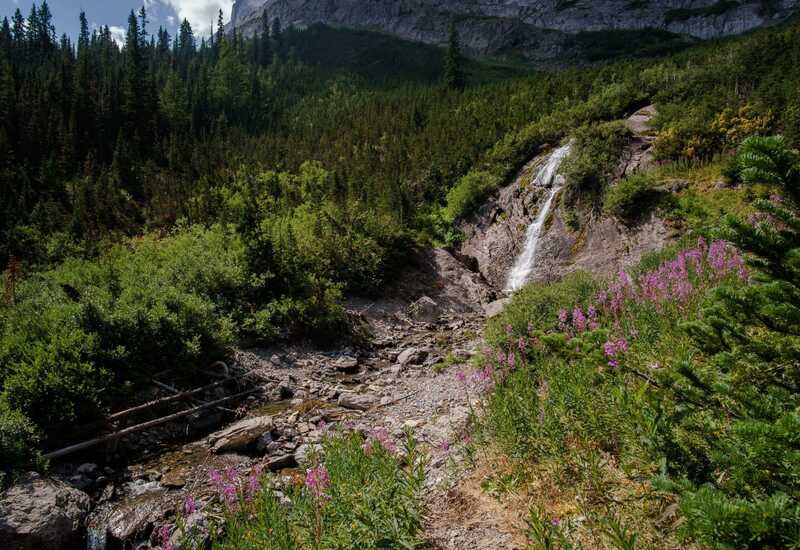 Follow Kananaskis Lakes Trail until the Upper Kananaskis Day Use Area. It is advisable to get there as early as possible as the parking lot can fill up during summer weekends. so you may have to strap in your pack and hike a few kilometers down the road to the trailhead. Hardly an inspiring way to start such a thrilling hike. Hopefully, you will have scored a parking spot in the lot so you can take a few moments to appreciate the beauty of the jewel-toned Upper Kananaskis Lake. Look for the pretty grey-crowned rosy finches who like to hang out along the shore. 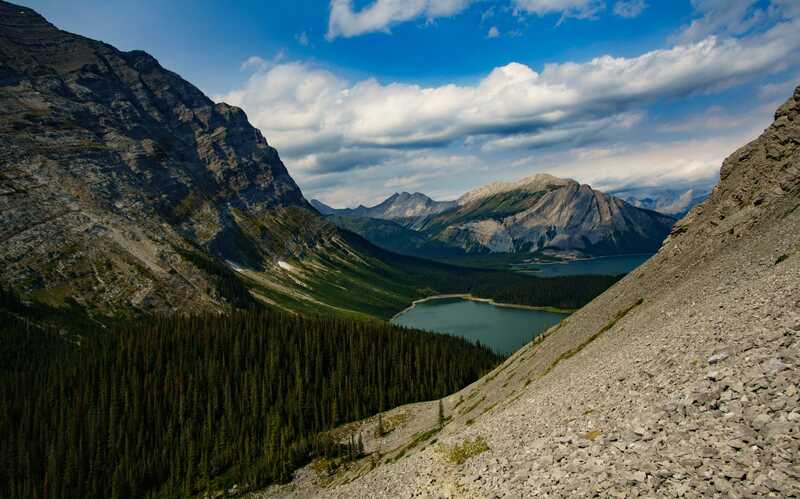 From your starting point at the lake, hike West along a well-defined and likely rather busy trail around Upper Kananaskis Lake. After about 1km you’ll hit the Rawson Lake junction where you’ll ditch the crowds and continue following the lake. Your next junction is on the left before hitting Point Campground. This junction is about 5km from the parking lot and is not as well-defined as the previous ones. Keep an eye out for the red flagging and a faint path on the left. The trail is a bit overgrown as you ascend to Hidden Lake. You’ll be doing a bit of bushwacking, climbing over or under fallen trees, which of course, can be a bit challenging with three day’s worth of gear on your back. It is worth it though, we promise! Once you reach Hidden Lake hike, take a few moments to enjoy the view of the tranquil water flanked by towering peaks. 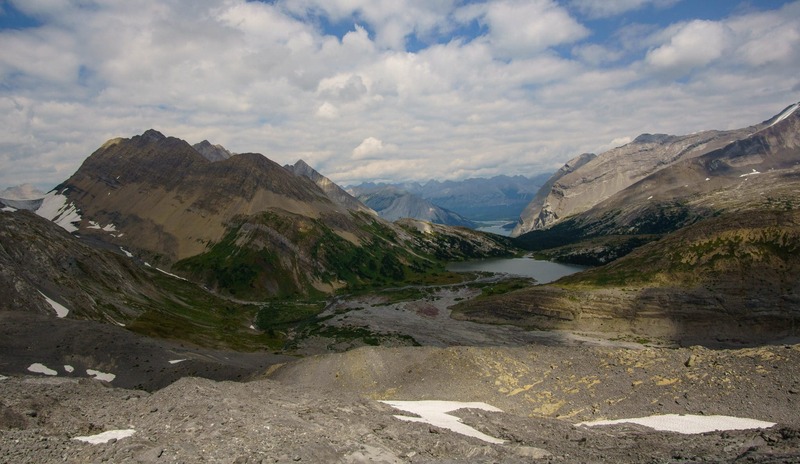 Simply hiking to the lake could be a worthy day trip on its own if you want to beat the crowds at Kananaskis Lakes but don’t necessarily want to commit to the ridgewalk. We spent a bit of time scoping out Mount Sarrail for a future trip as well. Note that if you do the hike early in the season, Hidden Lake may not have receded enough to clear the trail along the shore, which means you’ll have to continue bushwacking. We did the trail in early August and the trail around the lake was clearly passable. Check it out once there and hopefully you can, since it makes for a lot easier trekking. Your next waypoint after hiking around Hidden Lake is to go UP. For this portion you will gain abbout 500m over the next over 2.5km. This portion is steep but the views that begin to open up make it worthwhile. Behind you is an excellent view of Hidden Lake and Upper Kananaskis Lake. Once you gain enough altitude you’ll clear the forest and come across a bit of a scrambly section. Follow the boot packed trail over the scree, Fossil Falls is to your right. 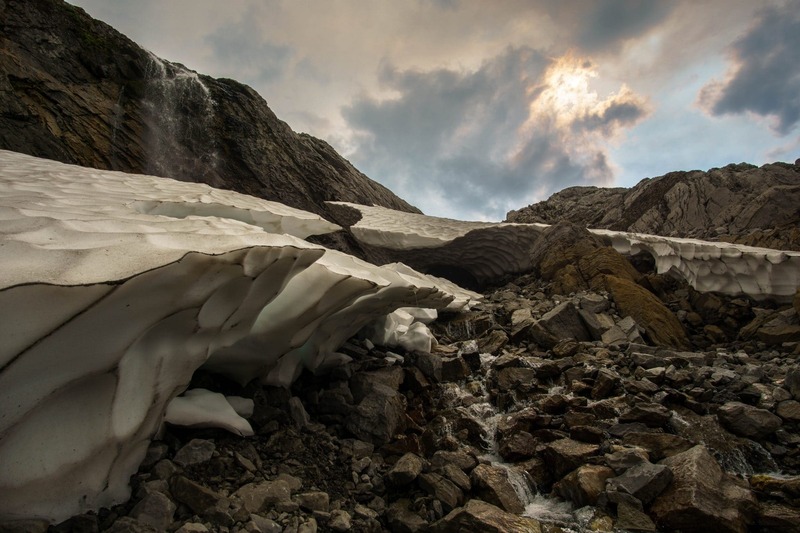 When we did the hike at the beginning of August there was a small bit of snow remaining and a snow cave. After trekking through the scree you’ll re-enter the forest and descend to Foch Lake and a nearby ranger station. From here you hike along a river creek and through a picturesque valley for about 1.5km. Keep your eyes peeled for hummingbirds! Ahead, enjoy views of Warrior Mountain and take note of its features so that you don’t make the same mistake we did….again, more on that later. Hiking through the valley, Warrior Mountain in the distance. The first thing you’ll see when you reach Aster Lake Campground will be it’s green “privy” (toilet). The smell inside was pretty awful when we were there, but the view from the loo more than made up for it. We recommend leaving the door open while you’re in there. Appreciating its majestic mountain views will help you transcend the assault on your olfactory senses. There are a few campsites spread out amongst the grass and along the river, and they are typically marked with a square pad lined with logs. There is a small waterfall right at the campsite that hardly gets a mention. It’s cool nonetheless, since it’s rare that you get to camp so close to a waterfall. Our new favourite backcountry campground! Scope out your favourite site, which will be challenging since they all feature pretty incredible vistas and easy access to the river. We chose one closer to the river but nestled against a small cliff to profit from its shelter. A couple minute walk further along the trail will reveal the straight-out-of-Lord-of-the-Rings Aster Lake. So beautiful this lake was, that despite having already hiked 12 kilometres we walked our dinner up there to enjoy it in the company of the lake. Aster Lake is easily one of the most beautiful backcountry campgrounds we’ve ever had the pleasure to enjoy. The combination of scenery, the running river, and lake only a couple minutes away delivered beauty in spades, and we decided it was somewhere that we would like to come back to as a base for other backcountry pursuits, like Mount Sarrail! While you may have to expend some energy to get there, it’s worth it because you’re not going to be spending the night beside somebody else “camping” and listening to the roar of their RV’s generator all night! At Aster Lake Campground, all you’ll hear is the peaceful cacophony of its resident bird community with the babbling of river keeping the beat. The second day of the trip was only supposed to be 12 kilometers of hiking along the ridge and a descent to Three Isle Campground so we allowed ourselves a slow start the following morning in order to soak up more of Aster Lake and its campground’s good tidings. We made a luxurious second coffee and sat by the river watching American Dippers, Hermit Thrushes and Dark Eyed Juncos go about their crepuscular business. This would of course come back to haunt us, but we’ll get to that. After enjoying our delicious coffee at Aster Lake Campground, we reluctantly packed up our camp and moved onwards at around 11:00am. Our day began with a hike along the shores of beautiful Aster Lake, where we stopped to take few photos of the still waters reflecting Mount Northover and Warrior Mountain with pristine clarity. After hiking along the lake, we entered a pretty meadow filled with vibrant wildflowers. After about an hour, shortly after the meadow we came to a stream that fed Aster Lake. This is where we made our costly mistake….instead of turning slightly to the right to head up Mount Northover, we followed a draw along the dried up stream bed to the left. Perhaps earlier in the season, this mistake would be impossible to make, but do take note if doing the hike later in the season. We followed a faint trail along the dry creek bed going southwest, which eventually led to a well-defined path with cairns marking the way. Unfortunately for us, the trails and cairns were leading us the wrong way up to the base of Warrior Mountain. With the false confidence of a defined path and cairns pointing the way, we continued on over difficult, slabby terrain for more than 3 hours in the wrong direction. At least we got a good view of Mount Joffre! Continuing to think “this doesn’t seem right”, we eventually came to a viewpoint where looking to the North we saw the proper trail heading up to Northover Ridge. Much to our dismay, we watched people who had started at Interlake and hiked counter-clockwise about to descend to our place of peaceful mountain bliss at Aster Lake Campground. At this low point (low being relative, I mean any day in the mountains beats one in the office), we considered aiming back to Aster Lake for the night and hiking back to our car the way we came to avoid another long slog over steep and challenging mountain terrain. Northover Ridge may have to wait, and spending another night at Aster Lake was a pretty amazing consolation prize in our eyes. With that option of an exit in mind, we aimed toward where we thought the real Northover Ridge ascent began. As an aside, we are fairly experienced hikers. We have both done multi-day trips before, have some navigation training and have completed double digit’s worth of scrambles. This is not meant to read as a humblebrag, rather we’re intending on demonstrating just how easy it was to lose the trail in this section. The way back to the trail was challenging, steep to the point of being dangerous, and required experience manoeuvring around mixed-scree. We do not want any of you to make the same mistake as us since there could be serious consequences. This is probably a good time to mention that like most places deep in the Rockies, this is bear habitat and there is no cell-phone coverage! So after a not-so-easy hike back to the trail, which added an hour to our already 3 hour detour, the trail finally became apparent to us. What we had been hiking on was likely the approach to summiting Mount Warrior, and although its views were awe-inspiring, it was the opposite direction of our objective. The trail was pretty much directly across from the lake. In wetter seasons, I imagine that you would have to hike directly through the stream, but since it was so dry, we were tricked by the wrong well-marked trail. Hike with the lake on your right and aim toward a grassy knoll directly opposite the lake. It will not seem apparent from afar, but if you resist the draw to the left, it will eventually make sense and cairns will point the way. The right cairns! See the faint trail on the left? Too bad it’s the WRONG trail! We considered turning back to Aster Lake campground, but we had not booked for that night and didn’t want to rob anyone of their spot. If we camped there again, we would likely have to wilderness camp which is not allowed in Alberta Provincial Parks, but in certain circumstances can be understandable and perhaps preferable than hiking down a dangerous trail in the dark. We knew the remaining day ahead of us would difficult, but not insurmountable considering how long Alberta summer days are, so we decided to give it a try. The trail to the ridge is very steep which was not too welcome given our long detour but at least, at 4pm, we were finally embarking on the right trail. Before we felt too sorry for ourselves, we met a couple coming down the trail who had left Aster Lake earlier than us in the morning and had made the exact same mistake. After finally finding the trail, they had gone up to the ridge, walked around, but did not follow it through to Three Isle Lake campground like we intended to do. Instead, they had to walk all the way back to their car at Upper Kananaskis Lake. They also informed us that someone took a hard right after the meadow following Aster Lake, which lead them along another well-defined trail up to a glacier but clearly not the ridge. That guy had to hike back down and continue up the same trail we were finally on. So were not the first to make a mistake on this trail even that day, but we were the only ones so foolhardy as to leave Aster Lake as late as 11:00am. If we didn’t make an effort to hike our remaining 10-11 kilometres quickly, we would be hiking in the dark to Three Isle Lake Campground. So, to be clear, if you’re leaving Aster Lake Campground, hike the clearly-defined trail to along the shore of Aster Lake. Where the meadow empties onto a creekbed, hike straight across and ignore the continued draw to the left. If you hike straight across the creekbed toward a grassy knoll directly facing the lake, you should see a faint trail to Northover Ridge. 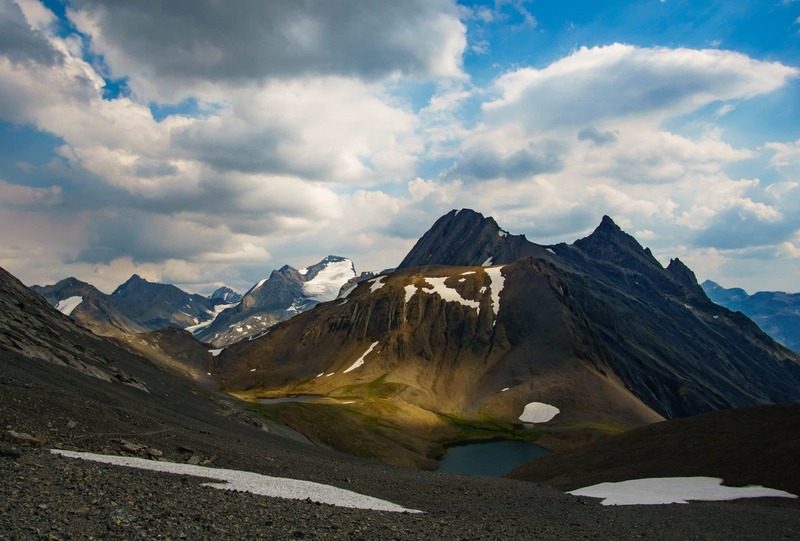 This is perhaps why the Copelands recommend hiking Northover Ridge the other way. It would be virtually impossible to lose the trail with the advantage of descending the ridge toward Aster Lake. From here our day’s woes quickly melted away as the views opened up to a never-ending expanse of valleys. You’ll also see a small tarn that is technically on the British Columbia side of the border where wilderness camping is allowed. We met a couple of hikers who were planning on making this their first stop along the trail, so this is an option if both campgrounds are full, but it will make for two very long days. Looks like a decent spot to spend the night! 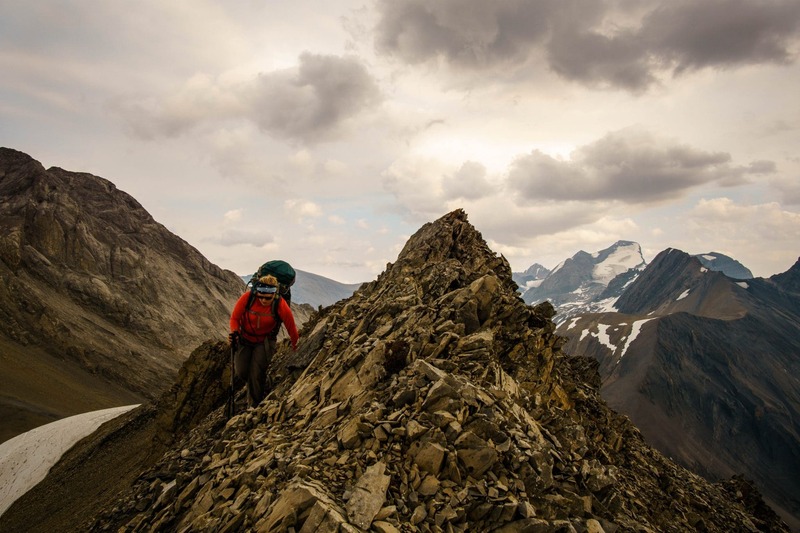 Enjoy the relative level-terrain as you hike in the shadow of Mount Northover, soon enough you will have to climb straight up a scree-slope to the ridge. There seemed to be a few trails leading the way. Pick your favourite and go for it. Gaining the ridge is worth the effort. In a way I hardly thought possible, new valleys, peaks and lakes come into the most expansive view. Take a moment to bask in the wonder the ridge provides and to steel your nerves. You’re in for some excitement to say the least to get to your roost for the night. Northover Ridge begins with a step over an easy crux. If you’re not used to this terrain, this step can be frightening, but hold on to your butts, it’s going to get a lot worse. While the ridge provides some of the most expansive and rewarding views in all of the Alberta Rockies, it is not without its drawbacks. On top of Northover Ridge. British Columbia on the left, Alberta on the right. After the initial challenging first step, it continues with wide footing with views to the southwest (I think) of the Continental Divide and Joffre Creek on the left, and a massive cornice and glacier on the right. Although it may look like solid snow, do not think about stepping on the glacier. It is difficult to see as you’re walking right alongside it, but when you turn back, it is very clearly a cornice that could give way if you step on it. A fall in either direction could maim or even kill you. We’re not writing this to deter anyone from doing the hike, it has been called the best hiking trail in the Canadian Rockies afterall, but it is no Grassi Lakes, so it’s important to be prepared. The ridge continues straight for a time before drawing the left with a cairn to mark the turn. This is where the ridge becomes less of a nice backpacking hike in the Rockies, and more of a difficult scramble. Here the ridge narrows to just barely beyond a boot’s width and the safest way we felt to maneuver it was by crawling on all fours to ensure constant contact with the ridge. This was exceedingly difficult considering we had heavy packs on which were throwing off our balance. Exposed on both sides, a fall or stumble would likely prove fatal, so exercise extreme caution on the ridge! The camera went back in it’s case for this part so I’m afraid there are no pictures of this part of the ridge. It is very narrow and some people may find it difficult to cross, present company included. While I do enjoy high Rocky Mountain Views, exposed ridges like this seriously harsh my backcountry zen. I’m glad that we did the through-hike and completed the ridge, but I don’t like being this stressed on during my de-stressing activities. So while I would be thrilled to come back to the area, I could see myself only hiking up to the ridge to look around but not traversing it. 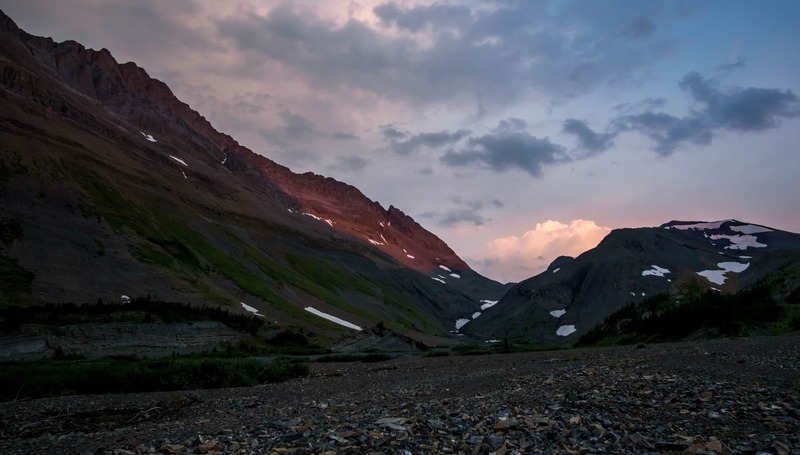 Still, I do not regret the trip since there are plenty of day hikes that can be done from either of the campsites and I would never have discovered them if it weren’t for Northover Ridge. Once over the seemingly never-ending steep and at times treacherous ridge, a steep descent down the scree will lead to the right toward a meadow. At this point, you are thankfully close to the Three Isle Lake Campground. Descend the scree slope toward a meadow and stick to the right of the meadow where there is a faint path. Other paths will lead through the meadow but they are not the intended one and may lead to you getting a soaker. At this point, it was about 9pm so the sun was just beginning to set. One small bonus of hiking so late in the day was that we were able to get an “alpenglow” picture, where the sun bathes an opposing peak in pink dusky light. Eventually, you will see a sign for Three Isle Lake and a reminder that random camping in the backcountry is not permitted. Perhaps we were just really tired, but it took us another 30 minutes to reach the campground from the sign. To get there, you hike along the picturesque and appropriately named Three Isle Lake, that features a chain of three small islands jutting through the middle. While it didn’t inspire us as much as Aster Lake, we could see how it would be a fun area to camp in for a few days while checking out the lakes and nearby peaks. Finally arriving at our campsite at 10, our 5-6 hour hike had turned into an 11 hour one. We were dead tired but relieved to not have to walk any further that day. Unfortunately for us, some morally bankrupt miscreant decided to squat in our reserved and prepaid backountry site at the campground, so we had no choice but to set up a random camping spot just outside the campground. 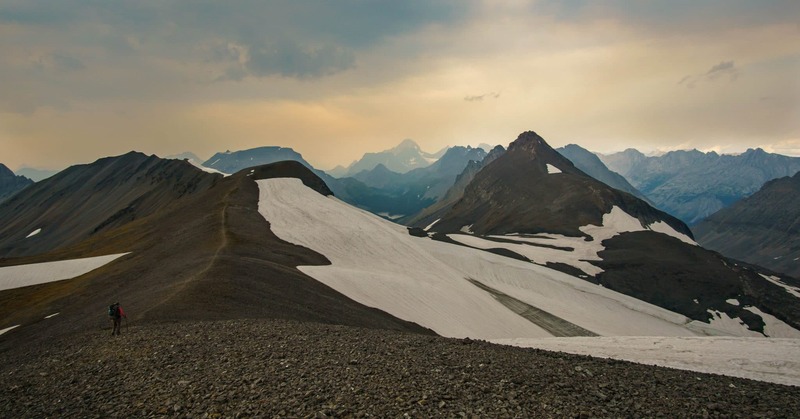 Although the chances of the backcountry police showing up to see if you have your permit and are camping in the designated campground is small, by not paying for and reserving a sport ahead of time, you rob Alberta Parks of much needed funds to conserve the wilderness that we all love so much. In addition, every wilderness squat messes with the Parks department’s intended management of the area and widens the trace that people in the backcountry leave behind. Like I said before, we understand that sometimes circumstances lead people to have to camp when they hadn’t intended on it, but in that case, you should actually squat and not steal someone’s paid for site. Three Isle Lake campground gets a lot more use than Aster Lake, so we were roused pretty early by the sounds of screaming kids and barking dogs, which I’ll still take over a generator any day. Before heading out for the 5-6 hour descent, take a bit of time to enjoy the views at the lakes. In a perfect world, we would have arrived in good time to secure our actual spot, and explore a little around the lakes without our packs. Instead, when we arrived it was pretty much night and the moon rose as we ate our dinner. We were eager to get down so exploring the lakes will have to wait until another day! The trail to the Interlake parking lot is clearly marked and begins in the middle of the Three Isle Lake campground. Follow the trail to Forks Campground, beginning in forest before quickly opening up to a steep, knee-jarring descent along a rocky slope. Another picturesque waterfall will come into view and shortly after, you will re-enter the forest for most of the way to the parking lot. This is probably the least inspiring portion of the trek but pleasant nonetheless. Again, this is prime bear habitat so make lots of noise and carry bear spray. After 4km of steep descent you will arrive at Forks Campground which makes an excellent place to stop for a snack or lunch before filling up your water and heading the rest of the way out. When the descent path joined the mostly level Kananaskis Lakes trail, two girls informed us that there was a bear on the trail just ahead of us. I looked a little down the path and sure enough, only 50 or so metres away, a young male grizzly was nibbling on some berries right on the trail. Phil yelled to let him know we were near which made him take notice of us and move off the path. We stayed in a group of 4 with the girls we just met for the rest of the hike back to the parking lot and never saw the bear again. Once at the parking lot, your options are to hitch a ride from someone back to the Upper Lakes parking lot or to hike 4 kilometers along a hot, shadeless road to your car. This is a rather uninspiring way to end an incredible hike. Luckily for us, the girls we banded up with after the bear sighting gave us a lift back to our car so we avoided the slog along the road. If you were doing the trail in a group, you could park a car at each end of the trail to eliminate this stretch. Most will do this trip as a 3 day backpacking adventure with stops at the Aster Lake and Three Isle Lake backcountry campgrounds. Crazy insane trail runners have been known to do the whole trip in a day. 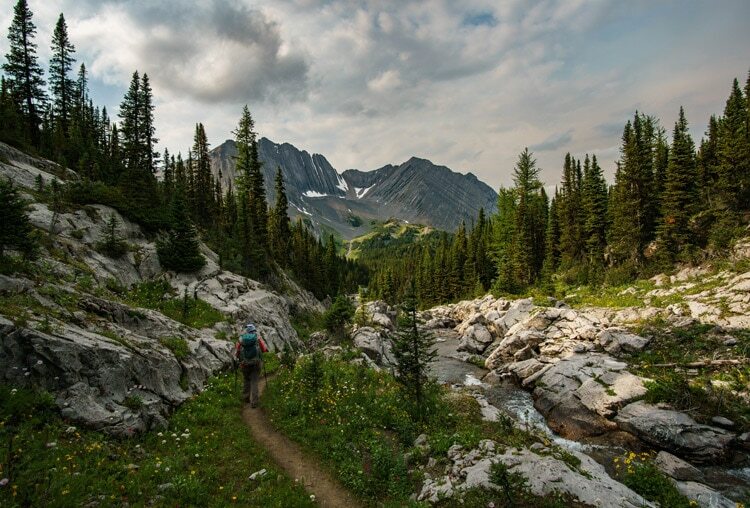 We’d recommend lingering and taking as much time as possible to enjoy it as this part of Kananaskis country is supremely beautiful. No need to rush! The most convenient campgrounds to break up this trip are Aster Lake and Three Isle Lake. We consider Aster Lake one of the most beautiful campgrounds we’ve ever stayed at so would recommend making a stop there. If Aster Lake is booked up, British Columbia allows wilderness camping and the tarn we mentioned just past the continental divide would be a good place to spend the night. This looked pretty gorgeous and if you’re a strong hiker you could likely cut the trip down to two days as the tarn is roughly at the half way point. 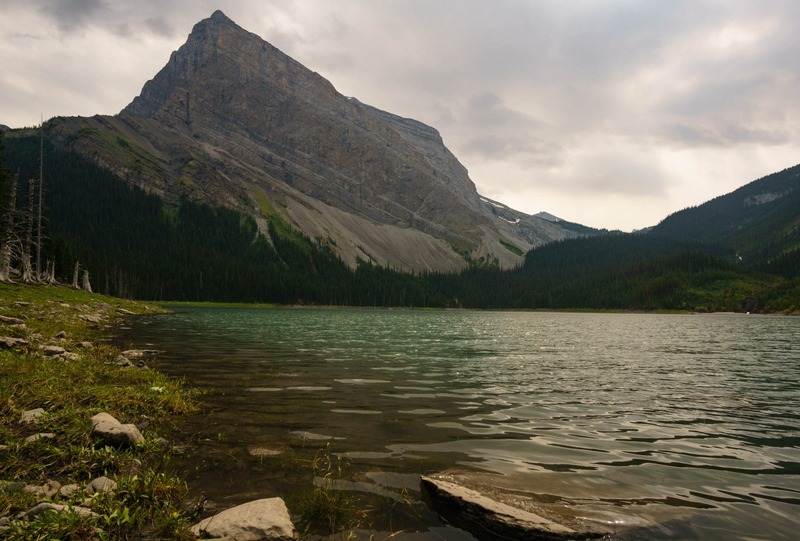 Point Campground: Not likely to be used on the trail as it’s a bit of a detour, Point Campground is a great place that’s easily accessible by a short hike or paddle on Upper Kananaskis Lake. 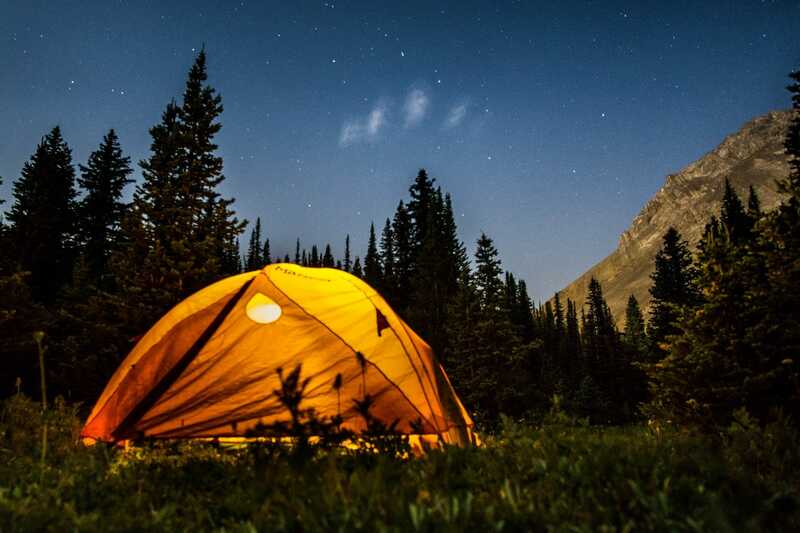 This is an excellent campground for those that want to enjoy one of their first backcountry experiences in Kananaskis. 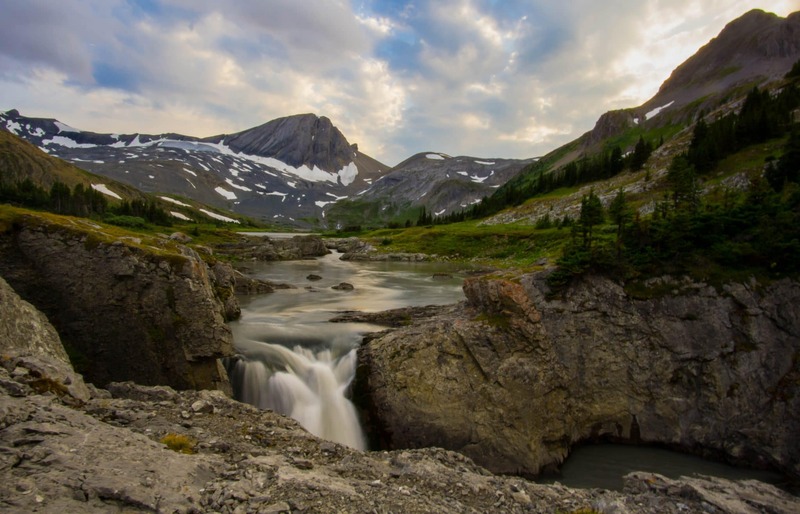 Aster Lake Campground: A 12km hike from Upper Kananaskis Lake. This is an absolutely gorgeous campground. Three Isle Lake Campground: A popular site when we were there. Nicely nestled in by Three Isle Lake and about 12km from Aster Lake over Northover Ridge. Forks Campground: A backup option if Three Isle Lake is booked up, at 4km further it would make for a long, but doable day two. Also a great place to enjoy your lunch on the way out! 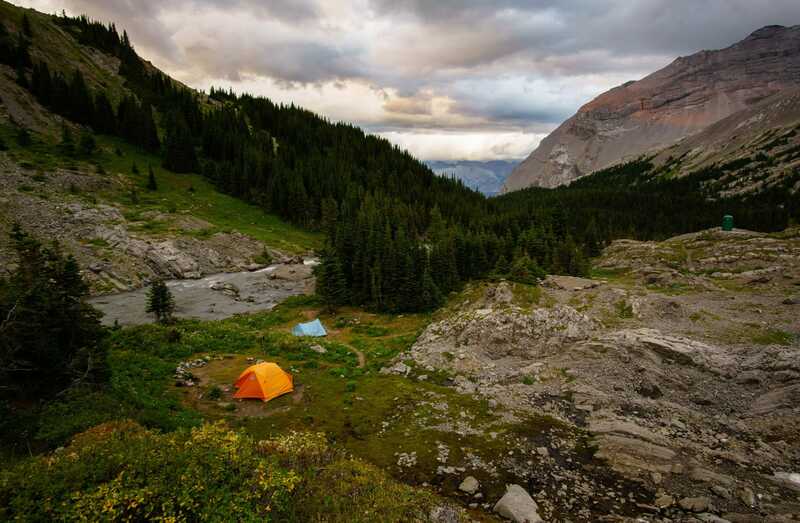 All of the campgrounds in this part of Kananaskis Country require a camping permits. These can be purchased online through Alberta Parks. Campgrounds book up quickly, especially on weekends, so plan your trip in advance and check their excellent vacancy calendar! 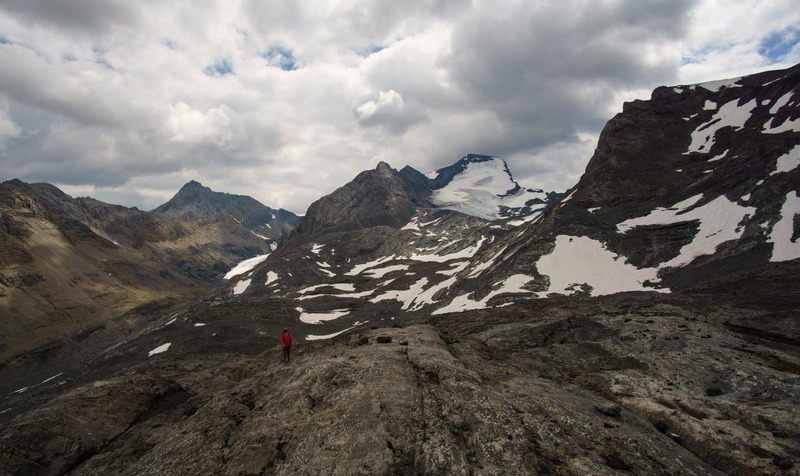 Northover Ridge easily lives up to its reputation as one of the best backpacking trails in the Canadian Rockies. 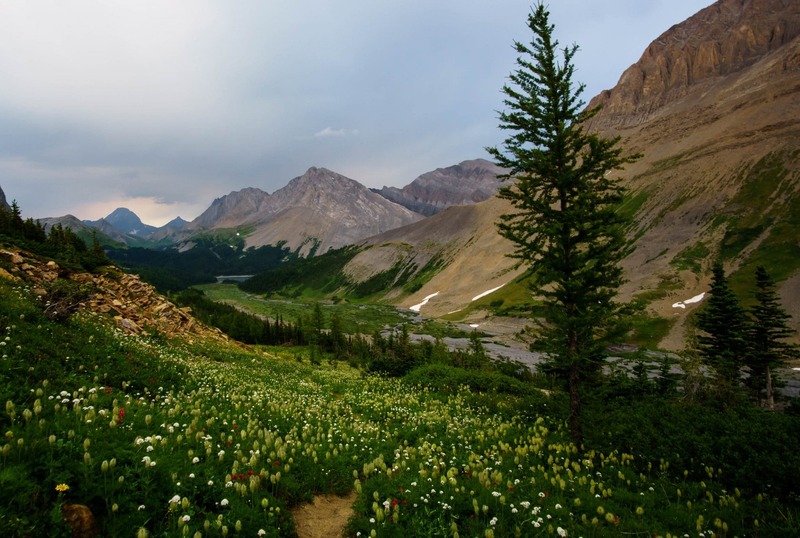 If you’re up for a challenge and looking to get off the beaten path (not literally though, as we explained above), head to this Kananaskis Country hike for otherworldly views, serene mountain camping, and a ridge with dizzying heights. Get lost in this picturesque wilderness experience and hopefully thanks to this post, not lost on the trail! I LOVE less crowded hiking finds! Especially if they are as gorgeous as these! My Florida hiking legs will definitely have to work their way up to braving these trailings though. But it will be all worth the work for those views. The picture of Mount Northover? Stunning! 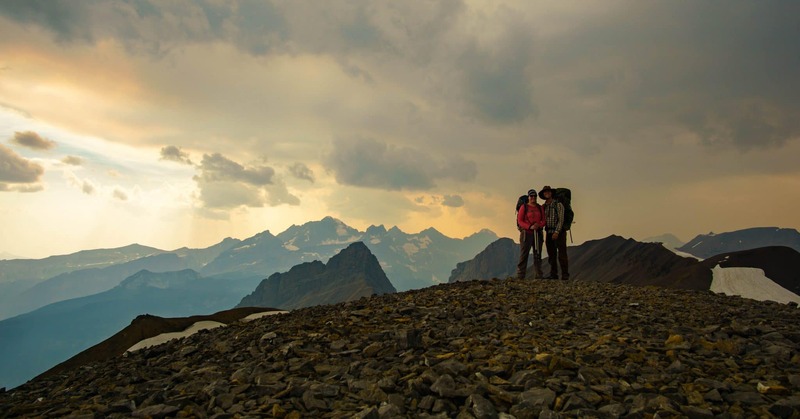 Do you need a backcountry permit to wilderness camp as you described by the tarns? Nope! As long as you’re on the British Columbia side (which the tarns are) you do not need a permit. On the Alberta side wilderness camping is not permitted (although rarely enforced). We’d love to do this trail this summer, thanks to your very clear overview! There’s only one thing we can’t figure out: do we need a special permit to enter this part of the park? Since we will be traveling with 6 persons through different parks, we were planning to buy an Annual Discovery Pass for this period, but if we check the parks which we are allowed in, there’s no mention of the Kananaskis region or Peter Lougheed. Only Banff, Elk Island, Jasper & Waterton Lakes are mentioned. So do we need to buy a seperate pass somewhere just for this trekking? On another note: we’d really love to book the campings that you mention, but each day that we check the possible dates, they are ALWAYS booked full immediately… Do you really have to wait until 3 months in advance or can you reserve dates for August easier buy phone? 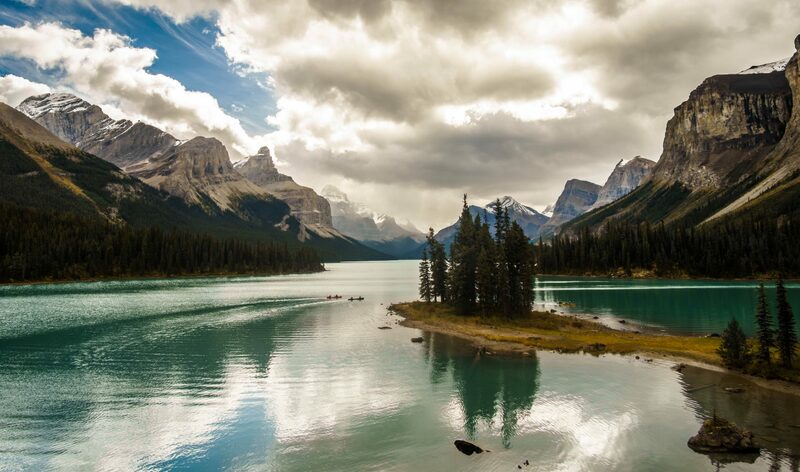 We are really scared to miss out, since we already experienced this with the campings at Maligne Lake. If you are just visiting the Provincial Parks for day trips, then you don’t need a permit. As for the other campgrounds, yeah I hear you. National Parks campgrounds fill up so quickly it’s really hard to make bookings. That said there are often cancellations so the best thing that you can do is to keep checking. We’ve seen popular campsites open up just days before we were able to go. We’ve never had much luck calling in but you can try that too. Good luck!